Mahi Mahi is a fatty fish that is rich in flavour. The spicy, fresh marinated-cucumber vinaigrette provides the perfect balance. Combine rice vinegar, juice of 1 lime, sugar, wasabi paste and oil. Slice the cucumber into thin ribbons and marinate in the vinaigrette. Portion the Mahi Mahi fillet in steaks of approximately 100 gr each. Season with salt and pepper and grill the fish steaks briefly on both sides, leaving the inside raw. Slice the buns open and grill cut side down on a skillet. 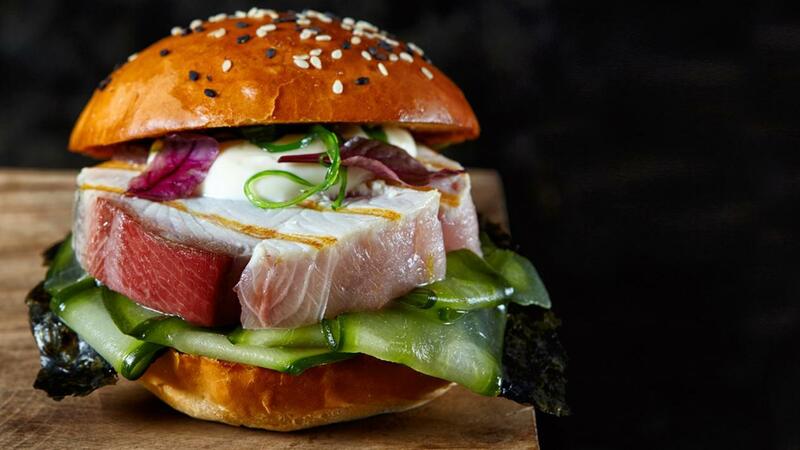 Build the sandwiches with the marinated cucumber, a nori sheet and the Hamachi steak. Garnish with mayonnaise, wakame and micro herbs.